When you’re tired of your music library and audiobooks, podcasts are there to fill the void. There’s never been a greater choice of podcasts to subscribe to either. What you need next is a rock-solid, feature-packed podcast player you can rely on, and we’ve picked out seven of the best for your consideration. BeyondPod has a few features of interest to serious podcast enthusiasts, such as the ability to import and add your own feeds, and although it’s not quite as impressive as some of its rivals in the looks department, it’s still a great-looking podcast player. You can get basic playback features for free, but for extras—like device syncing, multiple download support, and customizable playback speeds—you need to cough up $5.99. It’s a little pricey for a podcast player, but we’d say the layout is just about worth it if you like the app’s style. The developer of BeyondPod has obviously tried to be as comprehensive as possible, with support for both Android Wear and Chromecasts. Another neat feature is smart playlists, where you can set up rules (like in iTunes smart playlists) to queue up podcast episodes. Castro is built to help you navigate through the increasingly busy podcast scene and has a unique feature called episode triage. Essentially it lets you preview episodes from your podcasts and save yourself a download and a listen if you don’t think you’ll be interested. Once you’ve found the podcasts and episodes that do appeal, Castro makes the process of queueing them up a simple and smooth one. You can reorder your queue at any time and even throw in episodes for podcasts you aren’t subscribed to, so there’s lots of flexibility. On top of that, the app looks great and comes with a night mode to ease the strain on your eyes later in the evening. There’s a sleep timer, a playback speed controller, and some useful discovery features that let you explore other podcasts you haven’t heard by genre. Doggcatcher is a heavy duty podcast manager that’s been around for a long time now, and what it lacks in visual polish (in some areas), it makes up for with a host of interface and configuration options. It’s also fully signed up with Google’s Material Design approach. 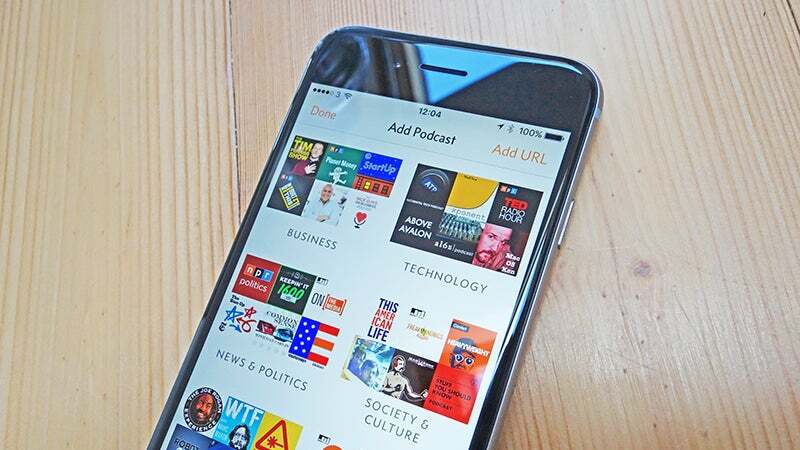 The app offers some advanced tools that podcasts enthusiasts are going to be interested in: support for password-protected feeds, for example, and the ability to add your own feeds. If you need a podcast app to do something then Doggcatcher can probably oblige. You can listen to your audio or video podcasts in pretty much any way you like, and there’s a sleep timer for dozing off to your chosen episodes. The discovery section is pretty simple, but you can search for new podcast content based on popularity and category. An simple but powerful podcast app for your iPhone or iPad, iCatcher is particularly good at helping you discover new podcasts that aren’t necessarily appearing in the usual popular and recommended lists. It’s also cheaper than a lot of alternative apps too. You get features like the ability to sign up to custom, password-protected feeds as well as a sleep timer and a variable playback speed setting within the app itself (it’ll even remember your preference for each podcast). There’s Apple Watch support too, if you need it. The deeper you go into iCatcher the more you find: options for cutting off the start and end of particular podcasts, a night mode theme, bookmarking inside episodes and plenty more, all wrapped in an interface that’s easy to navigate around and ultra responsive. “Powerful yet simple” and very much iOS-only, Overcast is a podcast app fromMarco Arment. It’s got clean lines, an intuitive interface, and some excellent features too: you get all the key Overcast features free, but you can remove the ads if you chip in $9.99 a year. There’s one extra feature available to premium subscribers, which is the option to upload your own files (like lectures or audiobooks) and insert them into your playlists. You also get the warm glowing feeling of knowing you’re contributing to the app’s development. Overcast is slick and straightforward, and everything feels sensibly placed. There are a lot of nice little design touches too, such as the volume level graphic on the pause button, and the ability to speed up playback and intelligently cut out any moments of silence. There’s a lot to like about Pocket Casts, from the bright and art-heavy look of the interface to the cross-platform syncing capabilities and web player (extra payment required). Pocket Casts doesn’t come cheap, but the few dollars investment is very much worth it. It’s the not-so-obvious features that aren’t immediately apparent that make Pocket Casts stand out. The ease with which you can queue up a succession of podcasts, the ability to skip episode intros, the variable playback speeds and the built-in sleep timer, for example. It’s difficult to think of a podcast app feature that Pocket Casts doesn’t have and when you combine that with the option to listen anywhere (even on the web) it’s a winning formula. Finding new podcasts to listen to is a breeze as well and there are various search options. Another of the long-standing podcast apps out there, Podcast Addict has built up an army of loyal followers down the years, thanks to a comprehensive feature set and support for various extras inside the same app interface, including audiobooks and live radio streams. There’s support for video podcasts as well as audio ones, plus features such as variable playback speed, silence skipping, volume boost, and episode streaming (if you don’t have time to wait for the full download). It works with Chromecasts and Sonos devices as well. Updates and downloads can be scheduled on a podcast-by-podcast basis and there’s the option to search through the app’s huge library of podcasts or enter the feeds yourself. Donate in the app to remove the ads, though this doesn’t change any of its functionality.